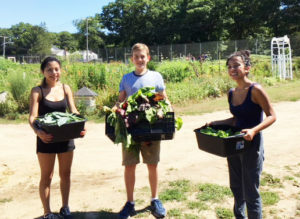 Stony Brook, NY: The Ward Melville Heritage Organization’s Youth Corps, a volunteer group of youngsters 11 to 17 years old, literally created their own farm to table event recently to feed the homeless and families in need. All of their hard work took place at HeartBeet Farms which is located on the property of Bethel Hobbs Community Farm in Centereach. They actually incorporated the same method of farming used by Dr. Samuel Thompson, who lived at WMHO’s historic Thompson House during the 18th century, mixing clam shells into the soil for added calcium – an essential element for plant health. 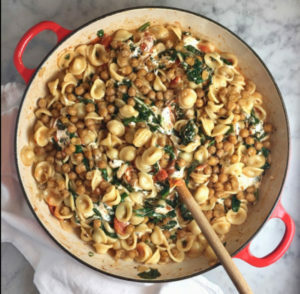 After harvesting beet greens and kale, they prepared Orecchiette with Greens, Mozzarella and Crispy Chickpeas, as well and a Beet Salad with Mustard Vinaigrette. They delivered the meals to the Saint James Church for their Wednesday food pantry event. Hobbs Farm, a non-profit, all -volunteer farm, was founded by Ann Pellegrino in 2007, with a mission to provide fresh produce to those in need through a network of local food pantries and programs. In 2017, Ann and Jen Ross formed HeartBeet Farms, a one-acre, for-profit farm on the property to continue to sustain the Hobbs Farm mission. Their onsite Education Garden offers school groups, scouts, families and individuals a chance to participate as well. More of the Youth Corps’ harvest will be served at “Create an Organic Garden” on July 25 at WMHO’s Cultural Center in Stony Brook Village. Hosted by HeartBeet Farms, who will offer a variety of tips and tricks, the event will take place from 1 pm to 2:30 pm and is next in the “55 + Club” ongoing series. The cost is $15 pp. For additional information on WMHO’s Youth Corps and additional event information, call 631-751-2244 or visit wmho.org or stonybrookvillage.com.